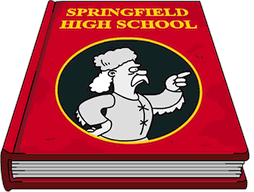 ← Springfield Jobs Act 2 is Live! 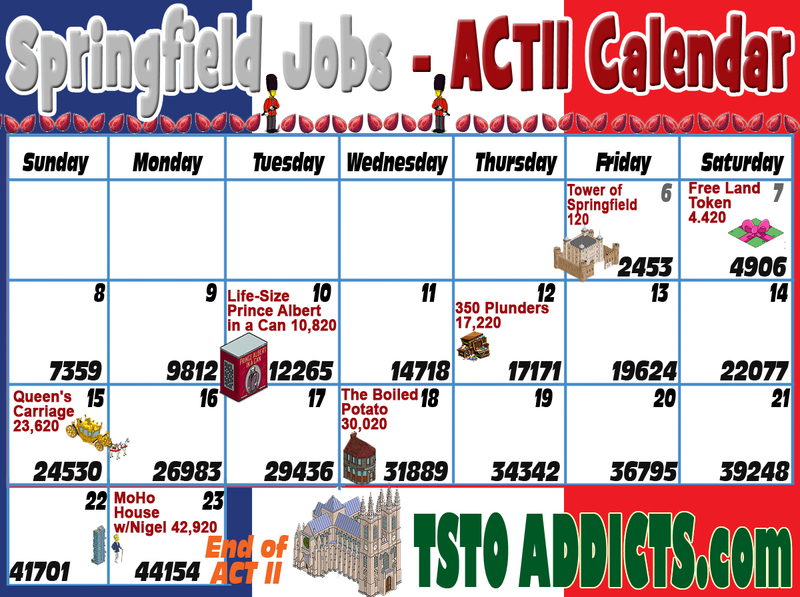 Springfield Jobs- Act II Calendar and Math for Getting It All! See? I do believe I told you that Act I was do-able…if you stayed on top of it. And it was. Some barely finished, while others, like myself, was done days ago. And some, got struck sideways by the “RollBack Glitch.” COME ON EA…Get on it!! Well…for Act II, there is some good news and some bad news. The good news is that the daily minimums are actually smaller than Act I. The bad news, is that this is because the act is spread across an even LONGER period of time. How long? How does 17.5 days strike you? Well…for me, it strikes me like a steak and kidney pie in the face…good and bad. I am a bit of an Anglophile, so I am looking forward to all of the stuff from “Jolly Old England.” I have saved up a ton of crafting currency, and stockpiled donuts…so I am READY! Let’s take a look at the numbers, and what you can win by hitting the targets! I thought they looked like water balloons, or Roma tomatoes. But, I guess if they say it’s a jewel…then it’s a jewel. And you are going to need a bunch of them to get the final prize. I had to look up what the heck the MoHo house was, but thought I remembered Nigel. Or maybe he is just that archetypal English Dude who looks and sounds like David Niven. I’ll have to do more research. In any case… CLICK ON THE GRAPHICS TO ENLARGE THEM. And here is the Digital Version…I can’t wait to add Chaucer to the rest of the characters that already haunt Springfield. The “afterlife” is getting quite cluttered around here! OK…Off to work on my jump start! 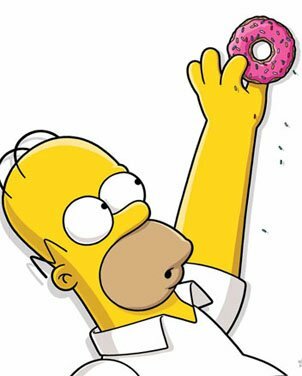 I am going to start a buying spree…and don’t even have to convert my donuts to pounds! Let us know what you think about Act II. 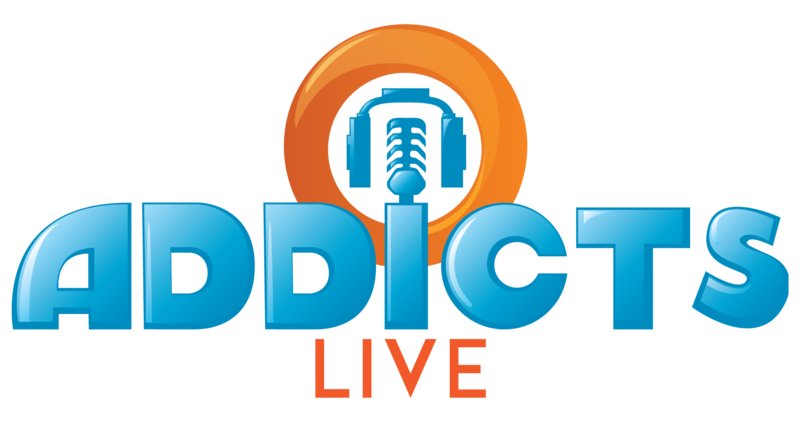 You know we LOVE to hear from you! (Did that sound sincere? Would be be better if I said it with an English accent?). 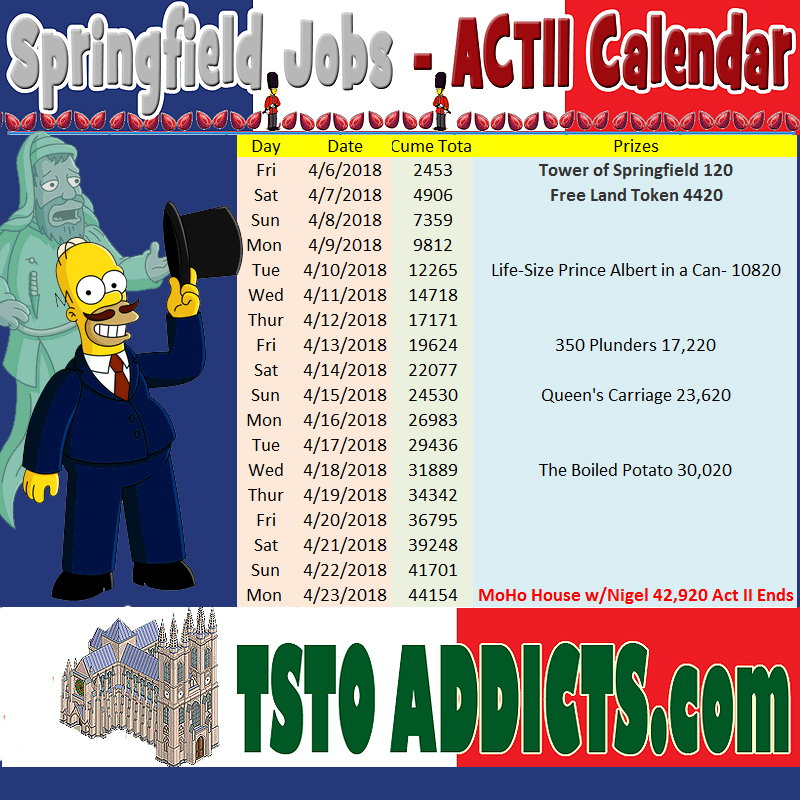 This entry was posted in Tapped Out and tagged Springfield Jobs Act Two Calendar, Tapped Out Springfield Jobs, Tapped Out Tips and Tricks, The Simpsons Tapped Out, TSTO Addicts, TSTO Event Calendar, TSTO Heist Event, TSTO Springfield Jobs Event, TSTO Tips and Tricks, TSTO Tower of Springfield. Bookmark the permalink. I am quite fortunate to have a lot of the heist qualifying characters in my town (perhaps that says something about me with such a large criminal element!) but I will unlock the final prize tomorrow, 9 days early and while I play 4 or 5 times a day depending on my schedule, I cannot believe I now have nothing to do for over a week other than accrue Bonuts (which I have already been doing for a couple of days). This event is a bit of a grindfest and way too long in my opinion.